We’ve known that Verizon Wireless would be getting the big phablet from LG called the Optimus Vu. In an effort to set its version of the Optimus Vu apart from the others on the market, Verizon is calling it something else. 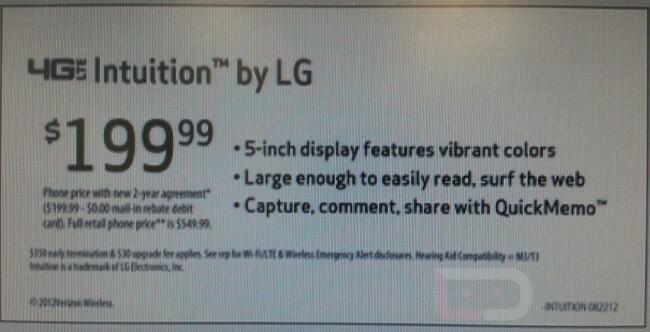 On Verizon, the device will be known as the LG Intuition. This is the same smartphone we’ve seen before with a five-inch display straddling the gap between a smartphone and the tablet. An ad has surfaced showing that the device will sell for $199.99. Naturally, that’ll be with a new two-year contract. The full retail price for the device will be $549.99. The ad also touts the Intuition’s QuickMemo mode. I’m still surprised that LG didn’t give the five-inch screen higher resolution.